I'm really getting into embroidered tshirts at the moment. There are so many fun ones out there but when I spotted this one on Instagram, it shot right to the top of my list. There really should be more dancing, don't you think?! I spotted this necklace in the Stedelijk Museum on my recent trip to Amsterdam and haven't been able to get it out of my mind since. Why, oh why didn't I buy it!! I love the simple but unusual arrangement, plus the red and pink colour combo is a total winner. Who doesn't love donuts?! I'm always drooling over Vicky's Donuts on Instagram so when I heard they were making their own book I got very excited. I've never tried to make donuts before but it says the recipes are easy so this seems like a good place to start. I love Rocky Horror Picture Show and I also love enamel pins, making this is the perfect combination! I also love that it comes in a number of different colours. Not only is it available in black and red (red is my fave, obvs), it also comes in two pretty pastel options if that's your bag - and sometimes it totally is my bag. I'm not planning any holidays in the sun but it doesn't hurt to be prepared. 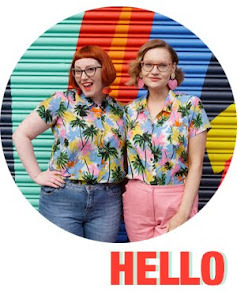 Batoko have a whole host of new print designs ready to pre-order, just in case I get whisked away to a tropical island, or you know decide to start swimming. I've fallen hard for this new lobster one (though the shark one from their previous collection is pretty amazing too). What's even better is their swimsuits are made from recycled plastics - read all about their mission statement here. I first fell for what I thought was a jumpsuit version of this print but it turned out it was a co-ord top and trousers. A dress is much easier to wear though, and just as fun! I stumbled across this tea towel while looking at tickets for the Picasso exhibition (I'm going to see it in July, in case you're interested). £35 is a bit steep for a wiping your dishes with but I adore David Shrigley's naive style and this one is surprisingly optimistic! I'm a big fan of these pouches, as they're pretty inexpensive but look quite luxe. I like to throw them in my tote bag to keep my smaller items in a safe spot. This one would be a great way to introduce yellow into my wardrobe, since it's a colour I love but fear to wear! 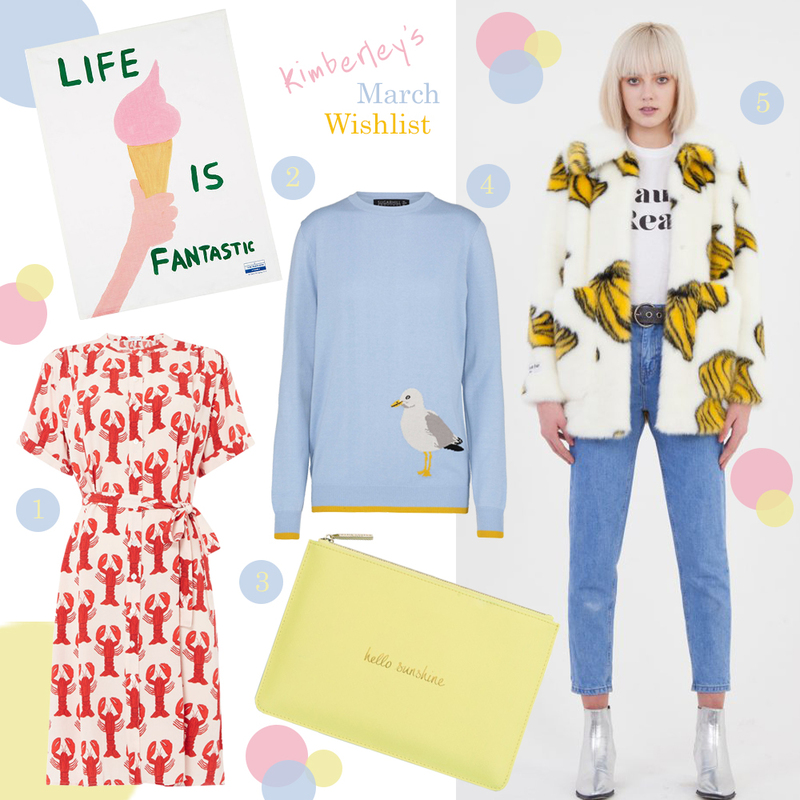 As much as I dislike actual seagulls, I really like them as a motif of British summer time and this sweet sweater is the perfect season transition. It's bright and fresh but still warm. Win-win! Every blogger and their dog is wearing Jakke London this spring and I'm all for the hype. Fun faux furs in even more fun prints- what isn't to love? The only difficulty is choosing just one- from the love hearts, leopard and pink combo or the monochrome chevrons, I'm in love!